The Boy and I would like to introduce to you something new in our adventures. We would like to show you how and what we eat on a normal daily basis. Not the usual recipes we share and replicate, or the reviews we write about as we dine out at fine establishments. We want to share with you our real cooking adventures (and *cough* misadventures) that so often happen in our kitchen. Obviously we do not eat spectacularly every day. Quite often, after a long day at work either one of us (usually him) would open up the fridge and stare at its contents. We would then proceed by bringing out items that may or may not go together, and create a smorgasbord of dishes or one-pot-meals that utilise what ever leftover ingredients we might have in the fridge or pantry. A lot of the times, we go with instinct (which is where the fun and excitement of creating a completely fail dish happens), and a lot of the other times, we create magic in our kitchen. As such, these Kitchen Files will be a general assumption of what we did and what it tasted like, but there will be no exact recipes as we won’t be able to replicate the exact tastes. 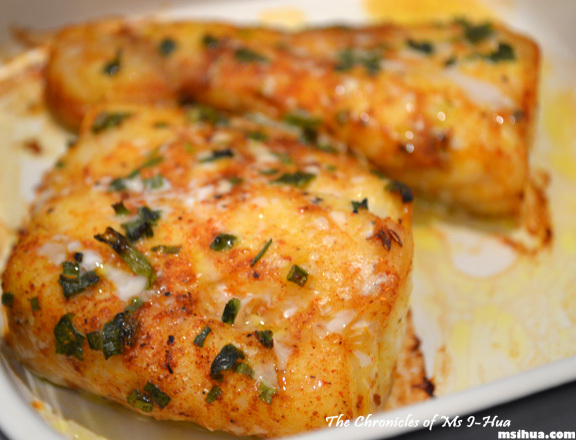 Baked Fish with Mediterranean Spices & Chives. So, first confession to make. We buy a lot of our groceries from our local Safeway and Woolworths. The meats and vegetables are actually pretty decent in quality in the area we live in, so we do happily indulge in easy access grocery shopping. We’re not too fussed if our food comes from the markets or from grocery land. It’s easy and frankly a faster dash than a walk through the markets. Don’t get me wrong, I love markets, it’s just that I don’t often have the luxury of spending time at the market, unless it’s the weekend. With the Basa fish fillet we bought, we decided to simply rub some Mediterranean Spices (complimentary of Maha Restaurant) onto the fish, sprinkle some dried chives flakes and bake it in an oven dish (covered with aluminium foil) for about 20-25 minutes. For the last 5 minutes or so, we removed the foil. The resulting effect was a very soft fish still moist on the inside. It was a nice delicate balance. We had this with rice. 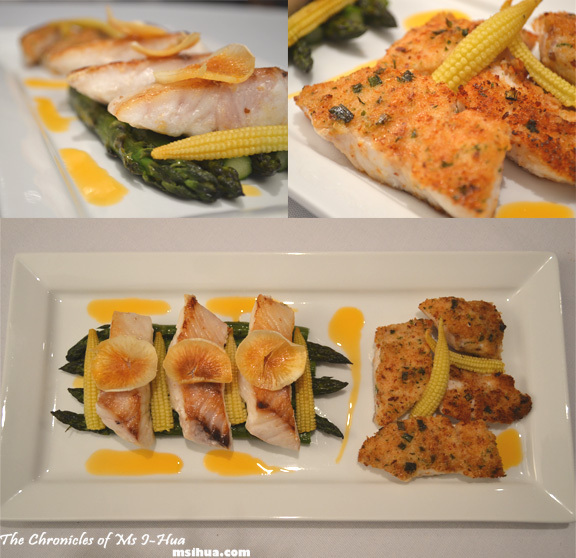 Fish Cooked Two Ways (Left: Pan Fried Fish with Asparagus, Baby Corn, Prawn Oil & Cassava Chips; Right: Deep Fried Crumbed Fish, Baby Corn, Prawn Oil). Inspired after watching the episode of Junior Masterchef when they had to make prawn oil for the Prawn Tortellini, the Boy got it in his head that he would need to replicate this recipe. Which was great for me. We always keep a stash of raw prawn shells (usually heads and tails) in the freezer should we need to make stock or in this case, prawn oil. Cassava chips were made from thinly sliced frozen cassava (purchased from Asian groceries) and frying them. They tend to split easily. The resulting mix in this was a successful seafood platter, full of flavour from the prawn oil. The crumbed fish was the winner between the two, but I could be bias as I love fried food. 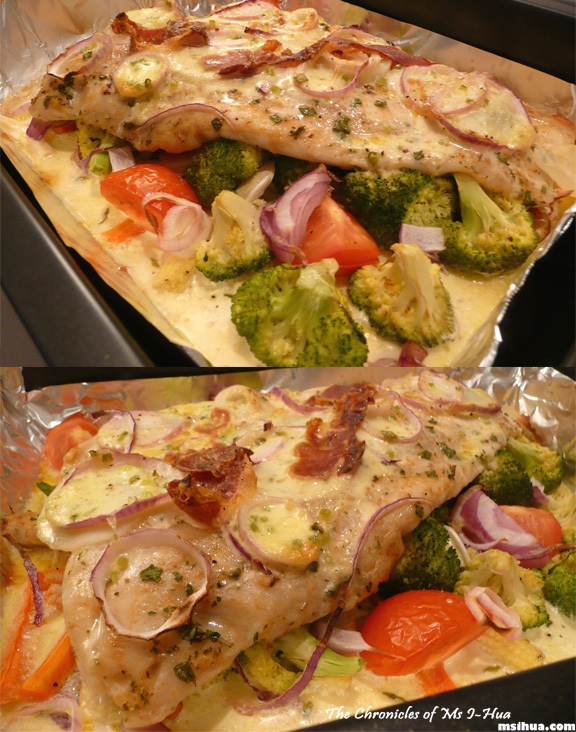 Mega Fish Fillet with “The Lot” (Brocolli, Baby Corn, Tomato, Red Onions, Cream, Chives, Jamon, Herbs). You aren’t the only ones thinking this as you read the ingredients used for this baked fish. It seemed to me that it was one of those weeks where we had a leftover surplus from a dinner/lunch party in entertaining our friends and ended up with an eclectic mix of random ingredients. We had to use a large roasting pan to fit the whole fillet. I know, I know. It should have been pretty obvious. The resulting effect was disastrous! The fish tasted “interesting”, it wasn’t so much the fish, but I think the jamon flavour had absorb into the cream and fish, giving it a delicate waft of unpleasantness. As I said, we weren’t really thinking about the taste, but rather that we needed to use everything in the fridge. So here you have it folks. Not everything we touch turns to gold. However, we have heaps of fun and giggles as we experiment in our kitchen. Ah, love the presentation on the first fish dish. Looks so pro! Celeste @ Berrytravels recently posted…Local Delights: Ching Han Guan – Famous in Ipoh, Malaysia. Hahahha… that first one was yum! you know i was just about to ask if you had any particular spot to buy your fruits and vegs. while i already know where to get good meat like my beef, chicken or fish, im still looking around for stalls that sells good fruit and veg without having to pay such a big premium! i guess my search continues! It also depends on where you live! The cooler/hippier places you stay, the more $$ you pay. If I were you. I’d head out to Footscray market 🙂 Or Vic Market at 6am! I’m with you, I try to use as much as possible rather than throwing it out. That said, one of the good things about having dogs is that basically nothing goes to waste, even the disasters – and if it’s too far gone (or too leafy green) even for them then the compost bin gets it! That baked fish at the top looks absolutely delicious! oooohhhh I love cassava chips! I can never have chips around the house because it’ll be gone before I know it!! 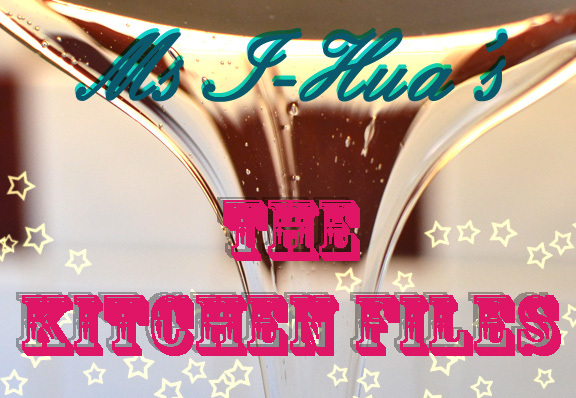 Can’t wait for more kitchen files episode!! Thank you! I like cassava chips too! BUUUUT I would happily eat all of this, and we both know that that’s your main concern every night. Love the Kitchen Files! I’m always so interested in what people actually really eat on a daily basis 🙂 Thanks for sharing. I love the prawn oil idea indeed! The Mediterranean spiced one looks nice! Oh and prawn oil… delicious! Love this post! & I’m totally craving fish now… The first time I successfully made a tagine sticks out in my mind as pretty special. I was just so amazed at how delicious it was! haha. Oh… our tagine post is coming up! Eat well from leftovers 😛 Nah.. sometimes I eat beans or mee goreng too 🙂 PROUD TO ADMIT THAT! Ames recently posted…Back for reals… no joke! Ahh you want an extra serve yes?